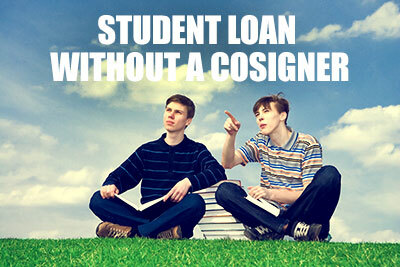 Let’s look at a variety of options available for student loan without a cosigner. A cosigner is normally needed for someone applying for an extension of a credit, or a loan, and doesn’t have strong enough credit, has bad credit, or no income. Having a creditworthy cosigner can definitely help get you approved and may even lower the interest rate on the loan. Every basis point matters when it comes to student debt, especially when it comes to private collegiate lines of credit. Applying for financial aid is easy and every student should look to maximize their federal financial aid benefits before using private debt. Luckily, the Department of Education offers an array of financial aid options to certain students. Financial aid can include grants, scholarships, and federal financing. Federal financing options should always be used before private debt agreements. There are a number of different federal financial aid options are available. The great thing about federal financial aid is that its don’t require or need a cosigner. Everyone is eligible for some amount of federal financial aid even without having a qualified cosigner. The most popular types of federal financing are Stafford Loans, Perkins Loans, and PLUS Loans. Without getting into too much depth, below are some short descriptions of each of these different types of loans. There are two main types of Stafford Loans available to undergraduate and graduate students. The first being Subsidized Stafford Loans. Subsidized Stafford Loans are awarded on the basis of financial need, and carry the benefit of subsidized interest. The federal government pays the accrued interest while a student is in school. Unsubsidized Stafford Loans are not need-based, meaning any student who submits FAFSA is eligible to receive aid. However, because these loans are unsubsidized the student is responsible for paying any interest that is accrued while in school. Stafford loans are not underwritten types of financial aid. For the 2014-2015 academic year, the federal government set the interest rate for subsidized and unsubsidized Stafford loans at 4.66% for undergraduates. Graduate students will pay a higher interest rate of 6.21%. The Federal Perkins Loan Program provides assistance to qualifying students who can demonstrate financial need and who are seeking a higher degree through an approved postsecondary school. Not every school offers Perkins loans to its students, so you should consult with the financial aid office to find out if the program is in place. Perkins Loans are not underwritten forms of financial aid. Students who qualify for Perkins loans are able to demonstrate financial need. A PLUS Loan is a type of financial aid offered to parents of students enrolled at least half time in eligible programs at participating and eligible post-secondary institutions or graduate and professional students at participating and eligible postsecondary institutions. PLUS Loans have higher interest rates, 7.21%, in comparison to other types of federal student loans. That being said, PLUS Loan rates can be significantly lower than rates offered by private student loan lenders. PLUS Loans are issued without the necessity of a guarantor, and are not awarded on the basis of creditworthiness. There is no credit check! Instead, parents using PLUS Loans must not show adverse credit history. For more information please check out our PLUS Loan guide. Unlike federal financial aid, private debt contracts must be approved by a private bank lender. There are a number of private college debt lenders in the industry. While each lender has different underwriting and approval criteria, there is a lot of crossover. When it comes to getting approved for a private student loan minus a third party signature, there are definitely a few pretty clear requirements. Have a good credit history. Most private student loan lenders are looking for individuals with a credit score of 660 and above. For students with little credit history, this might be a challenge. Having no credit history will make you ineligible for educational debt without a cosigner. Students should and can start building credit as soon as possible. Many banks offer “college cards” with low spending power. By paying your bill on-time each money you will slowly be able to build credit. Have good income. Most private bank financiers are looking for individuals earning at least $25,000 annually. Summer jobs do count as income, however, most students don’t earn that much from summer or academic year jobs. Be a U.S. Citizen, unfortunately, many public financing corporations are not willing to offer student financing options with no underwriting to non-citizens. If you are approved for college financing with a guarantor you should expect to pay a higher than average interest rate. Some private financing corporations offer rates above 10% for borrowers that apply devoid of an underwriter. The private lenders do this to protect themselves. From their point of view, a student debt deprived of a cosigner is much riskier to have on the balance sheet, in comparison to a cosigned debt obligation. Private student loan without a cosigner lenders include Sallie Mae, Wells Fargo, U-fi, Discover, Citizens Bank, and the list goes on. Applying for a private student loan without a cosigner is possible as you’ve seen above. That being said, there are definitely some clear disadvantages to getting a loan without an additional signature. College is getting more expensive each year, and federal financing limits don’t seem to be keeping up. While federal debt options are the best option when it comes to student loans, not everyone will be able to get by with the maximum amounts offered. Private debt obligations can also be tricky. As mentioned above, getting approved is difficult and the interest rates offered are often very high. Over the long run, having a high interest rate on a student loan without a cosigner may be very costly. Interest usually accumulates on a daily basis, and if you are stuck paying +10% interest you may be feeling the pain. That being said, if you are able to graduate and get a good job, you will probably be able to refinance the loans at lower rates. Start by submitting the Free Application for Federal Student Aid, aka FAFSA! Filing the FAFSA is required by many Colleges and Universities these days. But either way, you must file the FAFSA to get financial aid. To be eligible for federal financial aid without a guarantor you must submit the FAFSA. It usually takes about 22 minutes to complete and you can even file the FAFSA online. At LendEDU we created a detailed Free Application for Federal Student Aid Guide! When applying for private college financing without the help of cosigner, you really need to shop around. There are many student loan lenders in the industry and each offers different rates and terms. If you are approved without a signer, you will likely have a high interest rate. Shop around before signing that promissory note to ensure that you are getting the best rates available! Even 0.25% is important over the long term! How Can I Improve My Chances of Getting Approved for an Educational Loan? As with all types of loans, the amount you are looking to borrower directly affects your chances of getting approved. If you can lower your ask, you stand a better chance of getting approved for a private student loan without a cosigner. Why? Well, less risk for the private lender. Asking for a sizable chunk of cash when you don’t have the credit score or income isn’t a great strategy. Start by using as little student loan debt as possible! Look for scholarships and grants to lower the amount of money you need to borrow. Before locking yourself into a debt dilemma, you should look at grants and scholarships. These days there is a scholarship for everything and everyone. At LendEDU, we even have a scholarship search available for students. Grants and scholarships are free money! By spending just a few minutes a day searching for scholarships, you may be able to save yourself a significant amount of money over the long term. Unfortunately, student debt is a necessary tool for a lot of people. And, if you need a financing without a guarantor, start with federal financial aid before using private financing products!